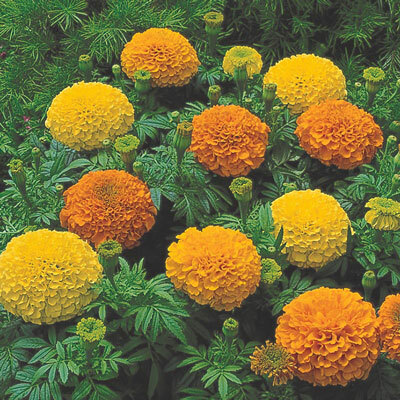 Inca II Mix Marigold | Henry Field's Seed & Nursery Co.
Blooms up to 5 Inches Across! Inca II Marigolds are sure to become the star attraction of your flower beds! Enormous double flowers in vibrant shades of gold, orange and yellow. Blooms appear early and continue all summer long until frost. Sturdy plants grow 12-18 in. tall—just right for massing in sunny beds and borders. Height 12 - 18 inches tall. Germination 7-10 days at 70-75 degrees F.
For each offer ordered, get approx. 40 seeds per packet. Height: 12 - 18 inches tall. Spacing: 8 - 10 inches. Color: Mix of colors. Vibrant shades of gold, orange and yellow. Flower Form: Enormous double flowers up to 5 inches. Soil Requirements: Average garden soil with good drainage. Seed Count: Approximately 40 seeds per packet. Pruning: Dead-head. Remove spent flowers to encourage rebloom. Size: Blooms Up to 5 inch blossoms.